The Supreme Court of India has cancelled all the licenses of carriers to whom spectrum was allotted at a much lower price by the then Telecom Minister, A. Raja. The court has also asked the Telecom Regulatory Authority of India (TRAI) to re-auction the spectrum which will be recovered at the current prices. Now TRAI has set and announced the base price Rs 3,622.18 crore for pan-India spectrum in the auction of radio waves which is to be held following the cancelling 122 licences. This base price is around 10 times higher than the price which A Raja had allocated spectrum and telecom licences to companies back in 2008. The operators, who won licenses, paid a total of Rs 1,650 crore for 4.4 MHz of pan India spectrum in 2008. But now they will have to pay a minimum of Rs 16,000 crore for the same amount of spectrum. 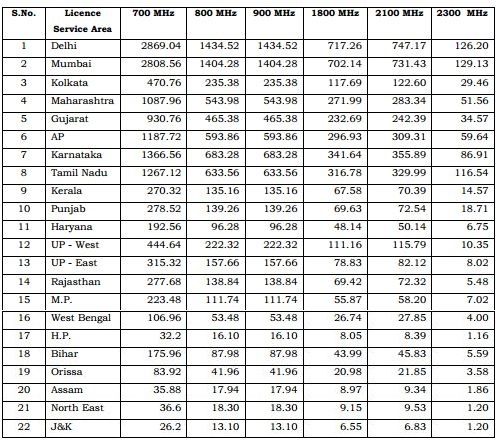 A pan-India spectrum in 1800 MHz band will cost Rs 18,000 crore. The reserve price is several times the base price of Rs 3,500 crore for 3G spectrum auction. And TRAI justifies the higher pricing as the 1800 MHz band is not a 2G band, but globally companies provide 4G service in this spectrum, thus the higher pricing. Also the winners of the spectrum will hold the licences for the service for 20 years and as the amount is huge, TRAI will allow the companies to pay out the auction amount over a 10-year period. Now this huge price that the companies will have to pay for the spectrum and license will indirectly go on to affect the normal mobile phone user, as the companies may eventually go on to hike the prices of services to recover the amount of money they have invested. Thus in the coming few years, users can eventually go on to pay higher prices for the calls which they as of now make for as less as 1 paise/second. Check out the base price for all bands in the 22 telecom circles below.